Click here to link to the model. The forecast: Obama has 320.7 expected electoral votes (see the definition of the expected value below) and a 332 snapshot EV. His 99.4% win probability is based on 497 electoral vote wins out of 500 trial simulations. His projected popular vote share margin is 51-48%, a 69-65 million vote margin. But the recorded vote is not the True Vote. The True Vote is never the same as the recorded vote. The True Vote Model indicates Obama would have approximately 371 EV, a 55% vote share and win by 74-59 million votes in a fraud-free election. Obama’s 332 snapshot EV assumes he will win all the battleground states except for NC. The races are very close in CO (9), FL (29), NC (15), NH (4), NV (6), OH (18) WI (10), VA (13) and that is why the expected EV is just 320.7. But keep in mind that the projections are based on LV polls which a) always understate Democratic turnout and b) are at least partially based on previous election bogus recorded votes. If FL, OH and NC are stolen, Obama will likely lose. Even though he won the True Vote, it was not enough to overcome the FRAUD FACTOR. To the pundits, the Fraud Factor is zero. They are not paid to project the True Vote. Their projections are based on Likely Voter polls which are always close to the popular recorded vote. The public has always been led to believe that the recorded vote was in fact the True Vote. It never is. The historical uncounted votes which are 70-80% Democratic prove it. And there have been approximately 40-45 million uncounted ballots in the last six presidential elections – according to the U.S. Census. That’s the bad news. The good news is that finally, after 12 long years, there is a near critical mass of election fraud awareness. The 2000 and the 2004 elections have been proven to be stolen. Of course, the media pundits know this. But they like their jobs too much to defy their editors. But the word is finally getting out after decades of media silence and misinformation. Yes, it’s a conspiracy, all right – a conspiracy fact, not a theory. The simple fact is that the conspiracy is the media and politicians who have kept the facts about our broken electoral system hidden from the public. What is the proof? The proof is…they never talk about the millions of uncounted votes or the proprietary voting machines owned and serviced by right-wing organizations – who just so happen to also count the votes.. Unlike the other election forecasters in the media and academia, the 2012 True Vote/ Election Fraud Forecast model projects both the True Vote and the official Recorded vote. 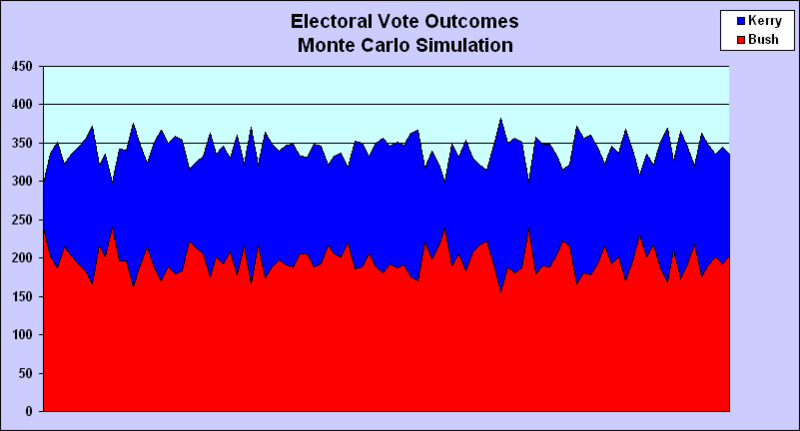 – The Monte Carlo electoral vote simulation is based on the latest state likely voter (LV) polls. The LV polls are based partially on a Likely Voter Cutoff Model which always reduces projected (Democratic) turnout. Another factor to keep inmind is that the polls are at least somewhat based on prior election recorded votes – which are themselves tainted. Even so, Obama has a 99% probability of winning the Electoral Vote (EV). Models which indicate an 80% win probability based on the latest polls cannot be correct – probably because they include extraneous factor variables. An experienced modeler knows how to KISS (keep it simple stupid). 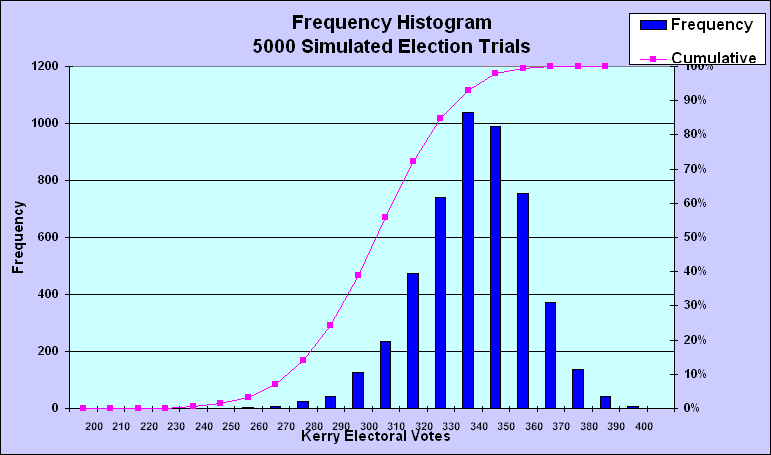 Only 500 election simulation trials are necessary to determine the EV win probability. Anything more than that is overkill. Calculating the expected EV does not require a million scenario combinations, either. Assuming the polls, the state win probabilities p(i) can be calculated. The expected EV is just a simple summation based on the expected state electoral votes: Expected EV = ∑p(i)* EV(i), where i =1,51 states. This is a quick summary of the changes that were made to the unadjusted, pristine exit polls in order to force them to match the recorded vote. Unadjusted National Exit Poll (13,108 respondents): Gore 48.5-46.4%. Unadjusted state exit poll aggregate (57,866 respondents): Gore 50.8-44.4%. True Vote Model: Gore 51.6-44.7%. Unadjusted National Exit Poll (13660 respondents). Kerry had 51.7%. Adjusted Final NEP ‘Gender’ – forced to match the recorded vote Kerry had 47.8%. Unadjusted NEP ‘Voted 2000’ (3182 respondents). Kerry had 51.7%. Unadjusted state exit poll aggregate (76192 respondents). Kerry had 51.1%. True Vote Model. Kerry had 53.6%. 1- The unadjusted 2004 NEP implies that Gore had 47.8%, Bush 48.4%, Other 3.8%. 2- The Final 2004 NEP implies that Gore had 44.6%, Bush 51.8%, Other 3.6%. But Gore won the popular vote by 540,000 and had 50.8% in the unadjusted exit poll. 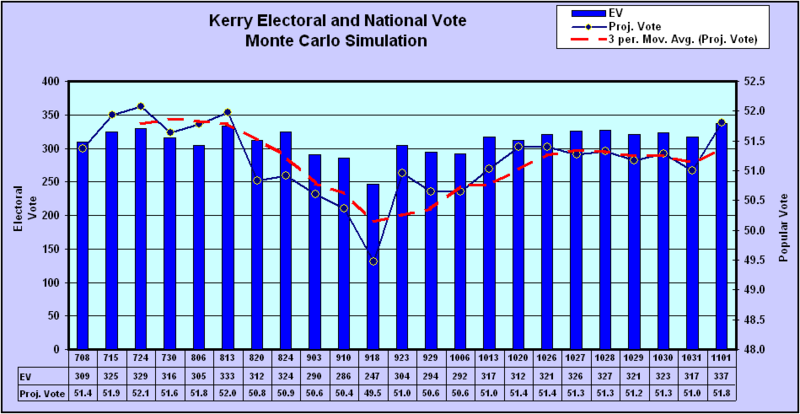 The unadjusted 2004 exit poll understated Kerry’s True Vote share by nearly 2%. Adjusted Final NEP ‘Gender’ – forced to match the recorded vote. Obama had 52.7%. Adjusted Final NEP ‘Voted 2004’ – forced to match the recorded vote. Obama had 52.9%. Unadjusted NEP total (17836 respondents). Obama had 61.0%. Unadjusted NEP ‘Voted 2004’ (4178 respondents). Obama had 58.0%. Unadjusted state exit poll aggregate (82388 respondents). Obama had 58.1%. True Vote Model. Obama had 58.0%. 1- The unadjusted 2008 NEP implies that Kerry had 50.2%, Bush 44.6%, Other 5.2%. This is close to the unadjusted 2004 NEP (Kerry 51.7%), but the 3rd party (Other) recorded share was 1.0%, a 4.2% discrepancy from the implied share. 2- The Final 2008 adjusted NEP implies that Kerry had 42.3%, Bush 52.6%, Other 4.6%. This is far from the unadjusted and Final 2004 NEP (Kerry 48.3%). The discrepancy is due to the Final 2008 NEP being forced match to the recorded vote. Kerry led from 4pm with 51% (8,349 respondents) to the final 13,660 (51.7%). The exit pollsters had to switch 471 (6.7%) of Kerry’s 7,064 responders to Bush in order to force the Final NEP to match to the recorded vote. Given his 51.7% share of 125.7 million votes cast, Kerry won by nearly 6 million votes. But the True Vote Model indicates he had 53.6% and won by 10 million. As a result of large 1988-1996 election polling discrepancies, Oregon decided in 1998 to revamp its voting system. It introduced vote-by-mail/ hand-delivered paper ballots. A robust chain-of-custody and mandatory random vote recounts proved to be a powerful deterrence to election fraud. Pre-election and exit poll discrepancies were minimized. This statistical analysis of Oregon’s voting history provides evidence that the vote-by-mail system introduced in 1998 has been a success. Let’s first quickly review the 1988-2008 presidential election anomalies. In 1988 Bush was the de-facto incumbent as Vice President. Dukakis led by 55.0-42.9% in the Oregon exit poll. He won the recorded vote by just 51.3-46.6% (a 7.4% margin discrepancy). Dukakis also won the unadjusted state exit poll national aggregate by 50.0-49.0%. But Bush won the national recorded vote by 53.4-45.6%. It is very likely that the discrepancy was due to GOP fraud. In 1992 Bush was the incumbent. Clinton led Bush by 49.3-25.7% in the Oregon exit poll but won the state recorded vote by just 42.5-32.5% (a 13.0% margin decline) . Clinton led the unadjusted state exit poll national aggregate by 47.6-31.7%. He won the national recorded vote by 43.0-37.4%. The 10.5% discrepancy indicates that Bush tried unsuccessfully to steal the election. In 1996 Clinton was the incumbent. He led Dole by 48.4-37.9% in the Oregon exit poll and won the state by 47.2-39.1%. He led the unadjusted state exit poll aggregate by 50.2-39.8% and won the national recorded vote by nearly the same margin: 49.2-40.7%. In 2000, Gore won Oregon by 47.0-46.5%. He led the unadjusted state exit poll national aggregate by 50.8-44.5%. He won nationally by nearly the same margin (48.4-47.9%) and had 48.3% in the Battleground states. The National True Vote Model indicates that he won by 50-47%. Nader had 6% in Oregon and 3% nationwide. Allocating the 3% Nader share, Gore would have won Oregon by approximately 50-47.5%. He had 50.8% in the unadjusted state exit poll national aggregate. The close match between Gore’s recorded vote, pre-election polls, exit polls and True Vote Model indicates that Oregon was representative of the True National Vote. In 2004, Bush was the incumbent. Kerry led the state pre-election polls by 48-47% and was projected to win by 51-48%. He led the Oregon pre-election poll by 50-44% and was projected to win by 53.7-45.3%. He won Oregon by 51.3-47.2%, a 3.6% improvement in margin over Gore. Kerry won the unadjusted state exit poll aggregate by 51.1-47.0% but lost the recorded vote by 50.7-48.3%. Kerry had 53.6% in the National True Vote Model – a 10 million vote margin. Bush improved on his 2000 recorded vote share in the battleground states as well as in solidly Democratic New York. But unlike the many states which red-shifted to Bush, Oregon shifted from Gore to Kerry. Kerry’s Oregon margin was 3.7% higher than Gore’s. This was primarily due to Kerry’s 65-13% lead in returning Nader voters and 57-41% edge in new voters. Kerry’s Oregon share was close to his 52% pre-election poll as well as the unadjusted state exit poll aggregate (51.1-47.6%). The close match between Kerry’s Oregon recorded share (51.3%) and the aggregate of the state exit polls (51.1%) indicates that Oregon represented the True National Vote. Therefore, it is clear that the election was stolen in the Battleground states and Oregon’s vote-by-mail system was virtually fraud-proof. In 2008, McCain was the de-facto incumbent. Obama led 56-39% in the Oregon pre-election poll and won the state by a neaarly identical 56.7-40.4%. He had 58.4% in the post-election survey. The True Vote model indicated he won by 56.0-42.8%. Obama won the national recorded vote by 52.9-45.6%, a 9.5 million vote margin, but he had 58.0% in the unadjusted state exit poll aggregate and 58% in the True Vote model. The triple match is powerful confirming evidence that the vote-by-mail system worked. Obama won the unadjusted National Exit poll (17836 respondents) by a whopping 61-37%. We can conclude that Oregon’s votes were counted accurately – unlike the other states. The close match between Obama’s 2008 recorded vote (56.7%), unadjusted state exit poll aggregate (58.0%) and the National True Vote Model (58.0%) indicates that Oregon was representative of the national electorate. In the 2010 Midterms, Ron Wyden (OR Dem Senate) won re-election with 57%, exactly matching the pre-election polls and Obama’s OR share. But popular progressive Democrats in other states (WI, IL and PA) all lost; their recorded vote shares were far below Obama, who won each state in a landslide. How come Wyden won handily but other progressives lost in WI, PA, IL? Did it have something to do with Oregon’s unique early voting system (mail and in-person) and it’s mandated hand recounts? To believe that Oregon’s mail-in/early voting system miscounted votes, one must also believe that Bush legitimately won all the battleground states and the national and state exit polls that showed Kerry winning were all wrong. But what if the exit polls were correct? What if the votes were miscounted? Then one would have to conclude that Oregon’s system worked. The other battleground states used electronic voting machines, punched cards and levers. The analysis tables provide a reasonable approximation of the National, Oregon and Battleground True Vote shares. 3. Equal 98% turnout of returning 2000 voters in 2004. 4. Equal Gore and Bush returning voter defection rates (they cancel each other). 5. Kerry won returning Nader voters by 65-13% Bush based on the National Exit Poll. 6. New 2004 voters is 2004 votes cast less returning 2000 voters. State DNV share = 0.59* (1+ state exit poll share – 0.5197)*new voters, where .5197 is Kerry’s unadjusted state exit poll aggregate share. The simplifying assumption is that there was zero net defection of returning Gore and Bush voters. But the 12:22am National Exit Poll of 13,047 respondents indicates that 10% of Bush voters defected to Kerry and only 8% of Gore voters defected to Bush. 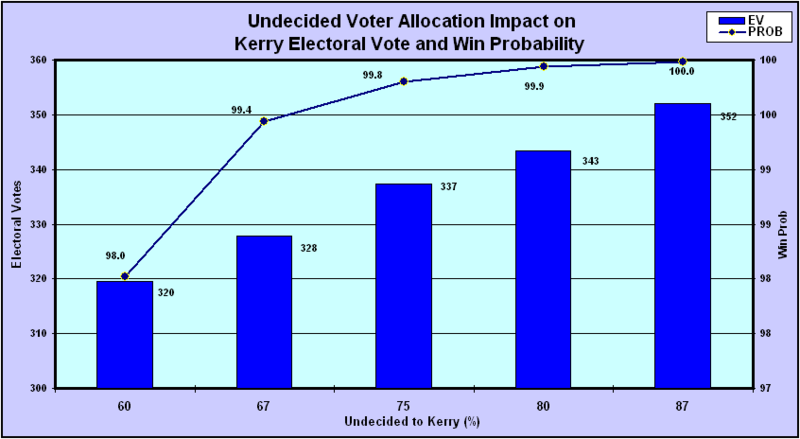 The 2004 True Vote analysis shown below indicates that Kerry had a 53.7% national share assuming a net 2% defection as opposed to 53.3% assuming zero net defection. 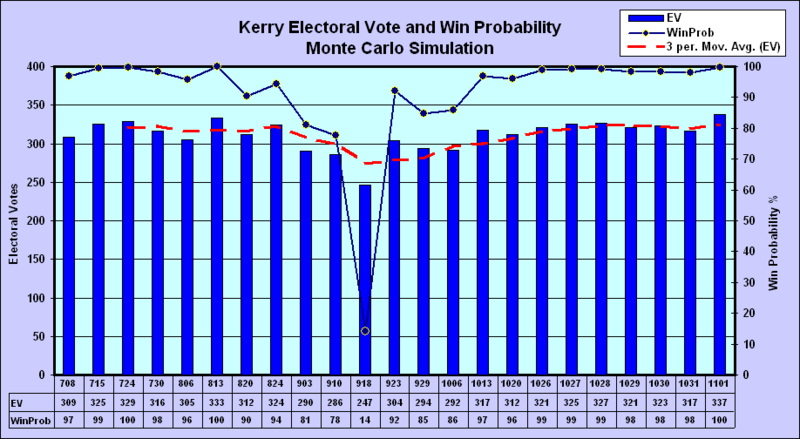 Two groups of three tables display the effect of various model input assumptions on Kerry’s vote share. Three tables display Kerry’s National, Oregon and Battleground True Vote shares assuming he had 54-63% of new (DNV) voters and 61-69% of returning Nader/other voters. Kerry wins all scenarios. Three tables display Kerry’s National, Oregon and Battleground vote shares for 91-99% turnout of living Gore and Bush voters. Kerry wins all turnout scenarios. In 2000, Gore won the recorded vote by 48.4-47.9%. In 2004 Bush won by 50.7-48.3% although returning Nader voters broke 65-13% for Kerry and he won new voters by 59-39%. That is not plausible. Gore won by 47.0-46.5%. With returning Nader and new voters breaking for Kerry, his recorded vote-count margin increased to 51.4-47.2%. That is plausible. Kerry led by 52.2-46.3% in the exit telephone poll. That is plausible. Gore won by 60.2-35.2%. Although returning Nader and new voters broke heavily for Kerry, his recorded vote margin declined to 58.4-40.1%. That is not plausible. Kerry led by 64.5-34.0% in the exit poll. That is plausible. Gore won by 53.4-41.6%. Although returning Nader and new voters broke heavily for Kerry, his recorded margin declined to 54.3-44.1%. That is not plausible. Kerry led by 60.1-38.6% in the exit poll. That is plausible. Why did Kerry’s margin increase in Oregon, a battleground state, and decline in strongly Democratic California and New York? Why was the exit poll so far off in California (11.6% WPE)? The voting machine breakdown was 29% on touch screens, 66% on optical scanners and 4% on punch cards. Why was the exit poll so far off in New York (12.2% WPE)? It voted exclusively on lever machines. Why were the exit polls so far off in the Battleground states (7.5% WPE)? They voted on punched cards, levers, optical scanners and DREs. In Florida 2000, there were approximately 185,000 spoiled punch cards (under and over-punched). According to the Census, 43,000 more votes were cast than recorded. Where did the 142,000 extra votes come from? Bush won Florida by 537 votes. In Florida 2004, according to the Census, approximately 238,000 more votes were recorded than cast, indicating net stuffed ballots. How many were uncounted? Bush won by 380,000 votes. In Ohio 2004, according to the Census, 143,000 more votes were recorded than cast, indicating net stuffed ballots. Approximately 300,000 ballots were uncounted (see Was the 2004 Election Stolen? by RFK, Jr.) How many votes were switched? Bush won by 119,000 votes. Final state pre-election polls were virtually all Likely Voter (LV) subsets of the full Registered Voter (RV) samples. Likely Voter subsets largely exclude “new” voters: first-timers and others who did not vote in the prior election. The Democrats won ‘new voters’ by an average 14% margin before Obama’s whopping 44%. Projections that ignore RV polls and focus solely on LV polls will inevitably underestimate the Democratic share, especially in heavy-turnout elections such as 2004 and 2008. In 2004, final pre-election projections were based on LV polls which understated voter turnout by 6%. Virtually all online political sites displayed LV polls (not RVs) and failed to allocate undecided voters. Mainstream pollsters allocated 65-90% of undecided voters to Kerry. His projected national LV poll share was 1-2% lower than the projected RV share. In New York and California, pre-election poll projections were a virtual match to the recorded vote-count share. But they were 5-6% below Kerry’s exit polls and True Vote shares. The same LV/RV mismatch occurred in 2008. Obama had a 53% projection based on LV polls but had 57% based on RV national polls after allocating undecided voters. Voting by mail results in high turnout, so the pre-election polls are RVs by definition. Kerry led by 50-44% in the final poll. After the undecided voter allocation (UVA), he was projected to win by 53-45%, matching the True Vote Model and within 1.6% of his recorded share. 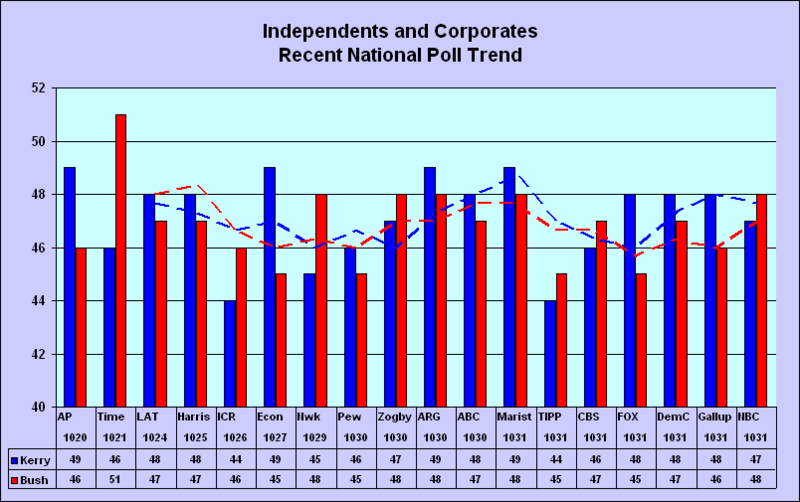 In the final weeks prior to the 2004 and 2008 elections, national LV polls were displayed on political websites; many did not allocate undecided voters. Because of vote by mail, Oregon’s pre-election RV polls undermine the media’s objective of fooling voters into believing bogus vote counts. The media primes voters before the election with LV-only projections and then covers up the fraud with final exit polls that are forced to match the vote miscounts. 1988 – Bush was Vice President. Dukakis had 51.3% in Oregon and 45.7% National. He did 3.2% better in the OR exit poll. 1992 – Bush was President. Clinton had 42.5% in Oregon and 43.0% National. He did 5.1% better in the OR exit poll. 1996 – Clinton was President. He had 47.2% in Oregon and 49.2% National. He did 2.2% better in the OR exit poll. 2000 – Clinton was President. Gore had 47.0% in Oregon and 48.4% National. 2004 – Bush was President. Kerry had 51.3% in Oregon and 48.3% National. 2008 – Bush was President. Obama had 58.4% in Oregon and 52.9% National. Is it just a coincidence that when Clinton was the incumbent, there was just a 1.7% deviation between the Oregon and National vote shares? Is it just a coincidence that when Bush was the incumbent, there was a 3.5% deviation between the Oregon and National vote shares? If the True Vote Model is correct and Oregon reflects the national electorate, then what does that tell us about the electoral system? Since Oregon switched to mail-in ballots in 1998, there has been a noticeable decline in the volatility of changes in county vote shares from election to election. Before the switch to mail, there was a 0.93 correlation between 1996 and 2000 county vote share and a 5.0% standard deviation. After the switch, there was a near-perfect 0.98 correlation between 2000 and 2004 county vote shares and a lower 2.2% standard deviation in percentage vote change. There was an even better 0.99 correlation for 2004 and 2008. along with a very low 1.5% standard deviation in percentage vote change. The system is getting better and better. The statistical analysis makes intuitive sense. Since the battleground states closely mirror the national electorate as by definition, Oregon’s recorded vote share should have been close to the other battleground states. But it was the only state that deviated sharply to Kerry. Oregon’s voting system is transparent. Optically scanned machine counts are verified by random hand-counts. Washington has also recently implemented a mail-in system. Touch screen voting machine precincts avoid paper ballots; votes can be switched locally or at the invisible central tabulators. Optical scanners are a step in the right direction, but the system is ripe for fraud without a system similar to Oregon’s mandated random hand-count of selected precincts. Punch card machines can be rigged to void votes by double and triple-punching the ballots after the polls close – as occurred in Florida 2000. Corrupt election officials are quick to blame “stupid” voters for not properly filling out h the ballots. Lever machines in NY, CT and PA did not use paper ballots; too few machines are placed in heavily Democratic precincts; defective machines that break down cause voters to leave the precinct; levers were “stuck” for Bush in 2004; lever gears can be shaved. Most important, tabulation of the votes is done on computers. In NY, Gore, Kerry and Obama each enjoyed a 7% higher late (paper ballot) vote share than they did on Election Day levers. What does that tell us? Here is an amazing statistic that very few are even aware of: Obama had 52% of the 121 million votes recorded on Election Day but he had a whopping 59% of the 10 million (paper ballot) votes recorded after Election Day. What are the odds of the 14% discrepancy? It’s like a 10 million sample-size exit poll. Kerry won new voters by 59-39% and returning Nader voters by 65-13%. In order to believe the recorded vote, you must also believe that returning Gore voters defected to Bush at a much higher rate than Bush voters to Kerry. But according to the 12:22am National Exit Poll, 10% of Bush and 8% of Gore voters defected. The above analysis indicates that Oregon’s mail-in system works just fine. Interested readers who find flaws in the assumptions, logic or math should present their findings to the author. Those opposed to 100% paper ballot voting by mail or hand-delivery cite these advantages in precinct voting: a) voters meet friends and make new ones, b) taking time off from work to vote, c) projecting a patriotic image by voting in full view, d) looking smart by touching the computer screen, e) exercising their legs while waiting to vote and f) getting free coffee. 1- Bush won a fair election. 2- Electronic and mechanical voting machines accurately counted the votes. 3- There is no proof of election fraud. 4- Election reform efforts are a waste of time. 5- There is nothing wrong with the national voting system. 6- Oregon’s voting system was rigged for Kerry since it was the only battleground state he won that shifted to him from Gore. 7- Pre-election state and national polls that projected Kerry would win by 51-48% after undecided voters were allocated were wrong. 8- Unadjusted and preliminary state and national exit polls that had Kerry winning by 5-7% were wrong. 9- The Oregon telephone survey that showed Kerry winning a 52.3% share was wrong. 10- Either returning Nader voters defected to Bush and/or he won a majority of new voters and/or more returning Gore voters than Bush voters defected. 11 -The National Exit Poll which had Kerry winning returning Nader voters by 65-13% and new voters by 59-39% was wrong. 12- The Oregon vote was padded for Kerry (51.4%) and Obama (56.7%). 13- Election officials in Florida, Ohio, NY and other states did a great job in making sure that the voting machines were not tampered with. 14- A problem with vote by mail is the elimination of exit polls even though they are usually wrong. 15- The True Vote Model is flawed since it closely matched the unadjusted National, Oregon and Battleground exit polls. 16- There is nothing wrong with the standard policy of forcing final state and national exit polls to match the recorded vote. 17- Final adjusted 1992, 2004 and 2008 National Exit Polls were correct: there were millions more returning Bush voters from the prior election than were alive. This is a plea: you may be our democracy’s last hope..
As one of the most trusted and respected Americans, you have monitored elections in other countries. America now needs your help in what many are afraid is an impending election disaster – a fraud of unimaginable proportions. Computer touch-screen voting machines are about to be installed throughout the nation. They have been determined by Johns Hopkins computer scientists and many others to have built-in software and hardware security flaws which can be exploited in many different ways to defraud voters and change the results of an election. These machines were used in 2002 Senate elections. Over 22,000 Diebold machines were installed in Georgia. The results of the elections raised eyebrows. The deviations from final polling results were astounding and defied historical precedent. The popular pollster Zogby claimed he had never seen last minute tunarounds like those which occurred in a number of hotly contested Senate and Governor races. And all the turnarounds favored the Republicans. The odds of this happening in a fair election are staggeringly low. We need your voice to fight for our most important freedom: the right to have our votes counted fairly, with maximum built-in security checks to prevent fraud. Until now, all voting machine software code has been proprietary; there are no redundancy audit checks and paper trails. The potential for fraud cannot be overstated. The 2004 elections will be the most important of our lifetime. This is the first time in history that a large segment of the population is expecting that the Presidential election will be stolen. Chaos will reign if nothing is done. We were in quiet shock in Dec. 2000 when the Supreme Court installed Bush. We will no longer remain quiet. President Carter, we ask that you provide one final great service to your nation: you must speak out NOW in calling for fraud-proof, audited voting machines. If we cannot have them by the election, then only PAPER BALLOTS will do. The time is growing short; the machines are already bought and paid for; thoughts of greed, not democracy, promotes their rapid installation. We ask that you monitor OUR elections this time, but not before we have FULL confidence that these machines will not be programmed to manipulate votes. As a nuclear engineer/physicist and humanitarian, no one is more qualified or respected than you are to provide the moral leadership required in getting this issue before the American public at this critical time. Your voice is too powerful to be muffled; you must realize the extent of our fears and the power of your bully pulpit. President Carter, your voice MUST be heard. This nation will rupture if there is widespread disbelief in the fairness of the election results. We shall never forget the 2000 Presidential election fiasco. Al Gore should be in the White House today; that is beyond question. We were fooled once; we must not be fooled again.